Sympatex - Reduction in the use of chemicals - Your partner for innovative functional textiles. Sympatex has been dealing intensively with the topic of pollutant management for many years and assumes a leading role in the sector of textiles functional specialists. Within the “Agenda 2020”, Sympatex’ goal is to make the entire laminate portfolio sustainable step by step by 2020 – this includes among others the elimination of fluorocarbons in the treatment area. The Sympatex membrane is PTFE-free and PFC-free which means that it does not contain any fluorine compounds. It is made of perfectly safe polyether/ester, a compound of polyester and polyether molecules, which makes it absolutely environmentally friendly and kind on the skin and also means it can be recycled like a PET bottle. Other membranes are made of PTFE (polytetrafluoroethylene) whose manufacture, disposal, heating and incineration may release PFCs which are regarded as ecologically problematic. The performance of fluorine-free polyester membranes and PTFE-based membranes are very similar, in terms of them being windproof, breathable and waterproof. To meet requirements related to function and care, the outermost fabric layer used in outdoor clothing generally has a water repellent treatment on the outside and a membrane on the inside. The Sympatex membrane ensures that functional clothing is waterproof. Water repellent treatments also ensure that the textile has durable water repellent properties. A DWR (durable water repellent) treatment is an extremely thin coating of the individual fibres of the fabric which renders possible that water simply forms beads and rolls off. This treatment prevents or delays the ingress of water into the fabric. As a result the garment does not absorb water, you do not start to feel clammy and the good breathability of the garment is retained. DWR technologies and their performance can generally be divided into two groups: Fluorocarbon-based DWR (PFC) and Fluorocarbon-free DWR. PFCs (per and polyfluorinated chemicals / fluorine compounds) are commonly used for textile treatments. These fluoroorganic compounds are regarded as ecologically unsafe, however. The high stability of the fluorocarbon compound produces resistance to a wide range of degradation mechanisms. As a result, PFCs which get into the environment remain there for long periods of time. Fluorocarbon treatments can be replaced by waxes, paraffins, polyurethanes, dendrimers or silicones. As a pioneer, Sympatex has been supplying an eco-friendly, fluorocarbon-free DWR treatment for textiles with its partner Rudolf Chemie, in the form of Bionic Finish® Eco, since mid-2008. Fluorcarbon-free treatments provide the same performance for all outdoor requirements as treatments which contain fluorocarbons. Oil and dirt repellent effects, which still necessitates the use of products which contain Fluorocarbons, are not generally necessary. 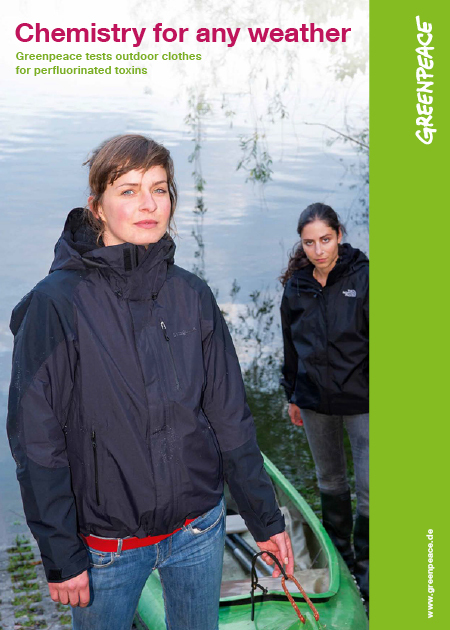 Since 2012, Greenpeace has repeatedly tested the pollutant content of waterproof and water-repellent outdoor products. During the examinations, two products were also tested, which are made of Sympatex materials. Both times, the Sympatex products were declared test winners: In the Greenpeace report from 2012 , “Chemistry for any Weather”, the jacket by the brand “Zimtstern” had the lowest concentration of PFC. After another test in the GP report “Chemistry for any Weather – Part II” of 2013, the “Kaikkialla” jacket with a Sympatex laminate had the best results. You can find the Sympatex statement here. Moreover, three outdoor brands have already committed themselves to DETOX. Two of these companies are Sympatex customers. You will find the companies that have already committed themselves here.